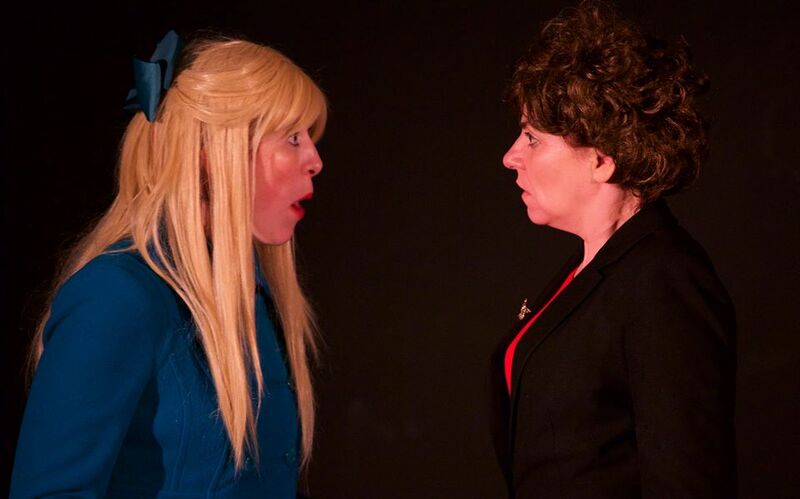 Rosemary Jenkinson’s satirical and entirely fictional political comedy is back with the further adventures of Michelle & Arlene. After their summer visit to Ibiza where the two game politicians grew closer than one might ever expect, coming to a new understanding around some policy issues, the leaders have concocted a new cunning plan to break the political deadlock around the failed talks. At a press conference, Arlene and Michelle announce that as of 9am on 22 December they will lock themselves into a room in Stormont and not leave until a deal is finalised. “It’s not a stunt” insists the DUP leader, played again by Maria Connolly who is dressed in a smart skirt and a jacket adorned with a familiar crown brooch that is only a hint at the depths of her loyal sense of fashion that will later be revealed. Soon the pair concoct a plan to slip out of their negotiating cage and spend a few days away in more pleasant environs. Mary-Frances Doherty plays Sinn Féin’s leader in the north of Ireland, sporting a blonde mane and a suitcase full of snacks. An envelope stuffed with who knows what is handed to a Bulgarian gangster in the audience, handbags are stolen, consular support is not an option for two negotiators on the run, and Arlene is firmly in the driving seat as the pair dash across Europe to get home for Christmas. Throw in some wood pellets, Prince William’s wedding, and a Biblical moment sitting on a hay bale in a stable the back of a horse box, and the farce is unstoppable. 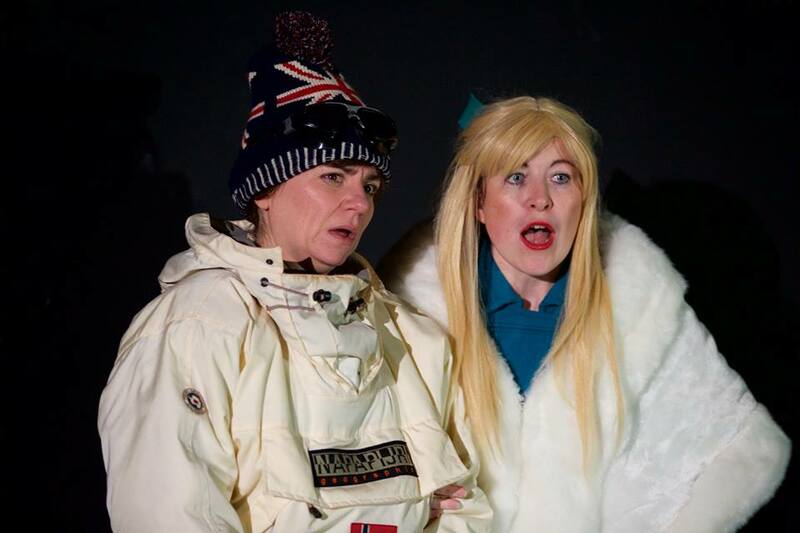 The portrayals are consistent with the first episode – Arlene’s beady eyes constantly dart back and forth and Michelle can’t help herself from needling her unionist colleague – though the addition of the Lord Carson power pose adds to the ludicrous nature of the slapstick. Projected animations add yet more humour between scenes with the politicians’ heads bobbing across a map of Europe as they travel around. There’s less singing than in first production, though The Power of Love duet (‘Love is the light / Scaring darkness away / I'm so in love with you / Make love your goal’) leaves a scary imprint in my memory. While the novelty of the original play is also somewhat diminished and the excuse for the roadtrip is whimsical, the production touches on a lot of familiar issues, makes caustic observations and continues to throw much-needed light on the lack of political progress and the policy cul-de-sacs that seem so hard to reverse out of. This contemporary one-act, one-hour performance will raise a giggle from audiences, shock them with the fictional actions of the recognisable characters, and leave them wondering whether this far-fetched, rude and irreverent production isn’t actually highly relevant. Michelle & Arlene Holiday Special: Planes, Trains & Tractors! 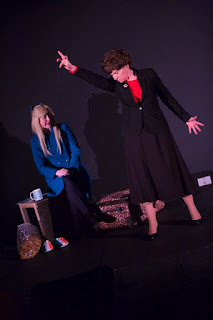 continues in Accidental Theatre’s space at 12-13 Shaftesbury Square on Friday 8, Saturday 9, Thursday 21 and Friday 22 December at 8pm.